Table 2-3-2-3 shows the sentencing of fine (excluding cases in which fine and imprisonment with or without work were imposed jointly; hereinafter the same in this subsection) in trials (ordinary trial procedure and summary trial procedure) in district courts, family courts, and summary courts in 2008. Most persons sentenced to fine went through the summary trial procedure. 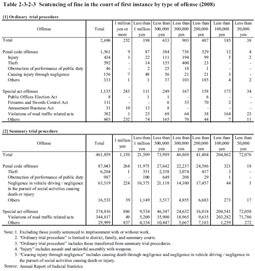 For the summary trial procedure, the majority of persons sentenced to fine were for violations of road traffic related acts (344,817 persons, 74.7%). For the ordinary trial procedure, theft was the most common offense with 592 persons (22.0%), followed by injury with 434 (16.1%) and violations of road traffic related acts with 382 (14.2%). Among these, the number of persons sentenced to fine of one million yen or more was 243 in district courts and nine in summary courts (Source: Annual Report of Judicial Statistics).